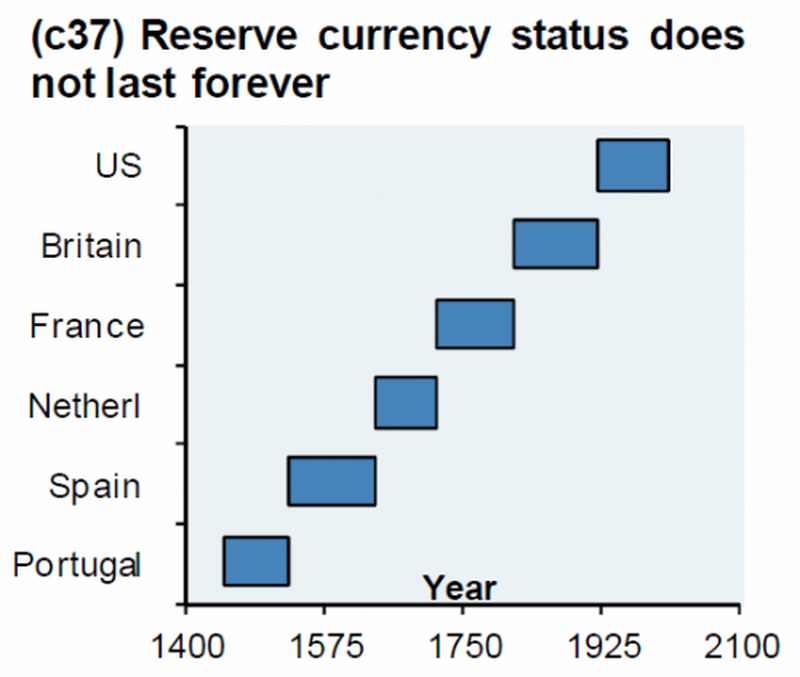 It purports to show the changeover in world reserve currencies from one era to the next, and tracks the rise (and fall) of the various colonial empires of the last several hundred years, from the Portuguese to the Spanish to the Dutch to the French to the British to good ol' Uncle Sam. The implication is obvious: No empire lasts forever, and sooner or later that empire will fall, and with it the world reserve status of its currency. As Mike Maloney points out in a recent video, this chart is wrong "because the world didn't have a reserve bank that was doing international settlements or acting as a hub of any type of monetary system until the Bank of England." Prior to the Bank of England's establishment (discussed in my documentary Century of Enslavement: The History of the Federal Reserve), there were predominant currencies, but nothing like a "reserve" currency. That being said, the point stands: Empires do rise and fall, and in the era of world reserve currencies and international settlements, their currency's status as a world reserve falls with them. The other implication of this chart stands out like a sore thumb: The American Empire's time is running out, and the dollar is going to go down with it. It's a theme I've discussed many times on the podcast, and something I've written about in detail over the years. The dollar is dying; everyone knows that. But the world reserve currency does not simply vanish; it is replaced. So here's the real question: If the dollar is going to go down, what will replace it? The answer to that question is not so straightforward as it might seem. In order to get a handle on that answer, let's take a look at a few of the latest stories to pop up in the unfolding "death of the dollar" narrative. The first story, titled "Russia Is Dumping U.S. Dollars to Hoard Gold," confirms what gold watchers have been noting for at least a year now: Russia is ditching the almighty greenback in favor of everyone's favorite yellow metal. Why Putin and his Kremlin comrades are looking to reduce their reliance on the dollar is hardly a perplexing puzzler. The noose of US sanctions is increasingly tightening around Russia's neck, so there's very little incentive for the Russians to hang on to the weight that's threatening to sink their fragile ship of state. As Putin himself puts it: "We aren’t ditching the dollar, the dollar is ditching us." So why replace dollar reserves with gold holdings? This isn't rocket science. Throughout much of the past several hundred years, the real reserve currency was gold. It is anyone's guess what the next world reserve currency will look like, but one thing is for certain: it will either include gold as part of its backing or it will be tradable for gold at a rate that reflects gold's current value. This is the reason that some of the biggest detractors of the dollar's world reserve status—perhaps most notably Russia and China—have been hoarding gold like crazy in recent years. Oh, did I mention China? Yes, they have been hoarding gold and selling off US debt, too. And they have created the Shanghai Gold Exchange, which, as I've explained before, dovetails with the Shanghai Energy Exchange's yuan-denominated oil benchmark to create the possibility of a "petroyuan" to rival the petrodollar. In short, the rise of the petroyuan makes it feasible for China to buy oil from its trading partners (like, say, Russia) directly with yuan, which that trading partner (like, say, Russia) could then convert to gold to move back home. Of course, it would be even easier if Russian banks and Chinese banks could facilitate direct exchanges between the two countries, settled in local currencies. And it would be ideal if all of this could bypass the SWIFT Network, which my readers will know has long been a tool of Uncle Sam's foreign policy (and an increasingly unpopular one, at that). Which brings us to our next story: "Russian banks join Chinese alternative to SWIFT payment system." That's right, the Central Bank of Russia (CBR) is announcing that an unspecified number of Russian banks are already connected to China's alternative bank network, the China International Payments System (CIPS), which I first reported on in 2015. Furthermore, the CBR is hyping Russia's own SWIFT alternative, the System for Transfer of Financial Messages (SPFS), which already has over 500 members, including "major Russian financial institutions and companies." Now, as my long-term readers already know, these "alternatives" are a sham. Indeed, one of the first things CIPS did was sign a memorandum of understanding to use the SWIFT Network to transmit its information. That's right, the SWIFT "alternative" actually relies on SWIFT to function! And as for SPFS . . . well, let's just say it's hardly ready for prime time yet, what with it's 9 to 5 operating hours and prohibitively expensive wire transfer fees. So, surprise surprise, the BRICS "alternatives" to the existing bankster system are no threat whatsoever to the bankster establishment. But they do tell us something important: The infrastructure for bypassing the dollar itself is almost in place. "Wouldn't you suspect, though, back when the Federal Reserve was created in the early 1900s, that even the Rockefeller family knew that there would be some time in the future where that whole scheme would run out of juice? When you've milked it as much as you could possibly milk it and the currency itself serves no further purpose for them to amass wealth they're going to abandon it for something else, right? Well, this seems to be what they're abandoning it for right now." For those who haven't listened to the full conversation yet, that "something else" that Wood is referring to is the idea of using blockchain and other "fintech" (financial technologies) to facilitate an entirely different type of world currency. "Tokenization is a method that converts rights to an asset into a digital token. Suppose there is a $200,000 apartment. Tokenization can transform this apartment into 200,000 tokens (the number is totally arbitrary, we could have issued 2 million tokens). Thus, each token represents a 0.0005% share of the underlying asset. Finally, we issue the token on some sort of a platform supporting smart contracts, for example on Ethereum, so that the tokens can be freely bought and sold on different exchanges. When you buy one token, you actually buy 0.0005% of the ownership in the asset. Buy 100,000 tokens and you own 50% of the assets. Buy all 200,000 tokens and you are 100% owner of the asset. Obviously, you are not becoming a legal owner of the property. However, because Blockchain is a public ledger that is immutable, it ensures that once you buy tokens, nobody can 'erase' your ownership even if it is not registered in a government-run registry." This may sound like a flight of fancy, but as Wood notes, there are already groups seeking to tokenize the world's resources to create a new blockchain-based currency called the "Earth Dollar." The Earth Dollar Alliance describes the Earth Dollar as "the world's first anti-inflationary asset-backed stablecoin and community currency, backed by 3.63 trillion CHF (Swiss Francs) (€3.22 trillion Euros) of Natural Capital Assets of the Earth, where our collective wealth can increase by protecting and restoring the Earth." Naturally, the Earth Dollar comes wrapped in a bunch of feel-good buzzword-laden rhetoric about sustainable development and protecting Mother Nature, but its core idea is, as Wood points out, ingenious. Evil, but ingenious. By backing the world monetary system on something like Earth Dollars, the banksters would be able to achieve all of their goals at once: to undermine the US dollar and any vestiges of national sovereignty; to create a new international currency out of whole cloth; and to claim ownership of the world's most precious resources as backing for their currency (in the name of "Mother Nature," of course). Now obviously we have a long way to go to get from point A (the current dollar reserve paradigm) to point Z (a global central bank-administered blockchain reserve system), and there are no doubt many twists and turns in the road from here to there. It's doubtful that the Earth Dollar is the currency that the banksters have in mind and I'm not suggesting that this is the currency that will one day back the world monetary system. But there is no doubt that the banksters are considering a move to some sort of centrally-administered blockchain currency as the backbone for the world banking system. The Bernanke is openly musing about a blockchain payments future. Lagarde is singing blockchain's praises. The Bank for International Settlements is writing white papers on central bank "crypto"currencies. The World Bank has launched the first global blockchain bond. SWIFT itself just just announced they would be incorporating R3's blockchain platform as part of its new payment standards framework, known as "Global Payments Initiative." As I've pointed out before, The Bitcoin Psyop is in full swing, and the central banksters are going to perform a bait-and-switch, confusing the public by seeming to embrace the decentralized, open accesss, distributed ledger promise of cryptocurrency but actually embracing the poison pill of centralized, closed access digital currency. It is of course too early to say where all this will end up. There are too many variables at play to make informed predictions about the way the dollar will be replaced as a world reserve currency. It's entirely possible, for example, that if the dollar was to die a sudden death, gold could be used as an international settlement currency, at least until a Bretton Woods-style agreement could be reached on a long-term replacement. 1) The international bankster oligarchy loves their inflation too much to tie any future world system down to the cross of gold. and 2) The international bankster oligarchy wants to replace the current nation state system with a global system of control (with them in the positions of power, of course). So if the banksters get their way, it is very unlikely that a national currency will be the bedrock of the international order ever again.